The room was nearly silent. The awkwardness was palpable. Even the speech therapist … bubbly, outgoing and friendly until just a few weeks prior, absolutely refused to look us in the eye, instead staring down at some imaginary spot on the table. 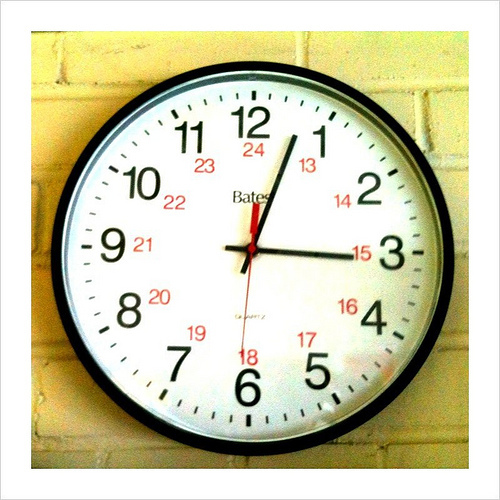 I remember looking at the clock – a standard issue, one-in-every-room school clock – and watching the second hand slowly sweep around until I heard the audible click that signified that another excruciatingly long minute had gone by. There were five of us gathered around the table: my husband and me, a speech therapist, an occupational therapist, and some sort of head of the special education department. We were there to discuss the next course of action for our then four-year-old first child. He’d started to resist their recommended therapies, crying at every session. They were strongly recommending a special needs preschool, and were in visible disagreement when we declined. They thought he was too attached to me, and that I needed to “be strong” and let him go. It wasn’t destined to be a happy meeting of the minds. He needed the socialization! He needed to catch up! He needed more intensive therapy! He needed to learn to separate from Mom and Dad! I felt sick. I’d never questioned our decision to unschool until that very moment. But in that room, under that fire, I questioned. Not only was our schooling decision under harsh critique, so too was my job as a mother. He was having issues separating because of me. They weren’t able to do their job because of me. He wasn’t going to reach his full potential because of me. I couldn’t breathe. Couldn’t even speak for fear of crying (that would come later in the car.) My heart told me one thing, and my head told me not to listen. Was unschooling really the right decision? Should we send him to the special ed preschool after all? It felt as though his entire life hinged on that very moment. One week later, our choice was clear. We’d reached an impasse with his therapists, and the current situation was no longer going to work. Everybody involved was miserable, most notably our son. We pulled him out of the system, renewed our decision to unschool, and didn’t look back. That meeting was eleven years ago. I have never, even for a moment, even in the darkest corners of my mind, regretted our decision. Unschooling was the best choice we ever made, not just for Spencer but for all of our children. And when people ask if unschooling is really suited for a child deemed “special needs,” I do not hesitate. Unschooling would work for any child, but it works especially well for a child with special needs. (And it should be noted too, that when it comes to unschooling there really is no such thing as “special needs.” We all have our own unique needs.) By its very nature, it is a completely individualized, personalized, respectful path; one that takes into account differences in personality, temperament, and learning styles. It is a way to fully honor and support your child – any child – and unschooling has allowed me to watch Spencer, along with his three siblings, soar and grow into who he is. Not who I want him to be, or who the schools want him to be, or who the “experts” want him to be … but who He wants him to be. Having a Hard Time Understanding Unschooling? How do you talk about unschooling?